Trail users at Lake Fayetteville should be prepared to take an alternate route this week. Crews have begun removing 19 established sycamore trees on the east side of the paved trail that runs along the lake dam between the marina and spillway bridge. Tim Nyander, the city’s utilities director, said the work is expected to last through the end of the day on Friday, Aug. 4. 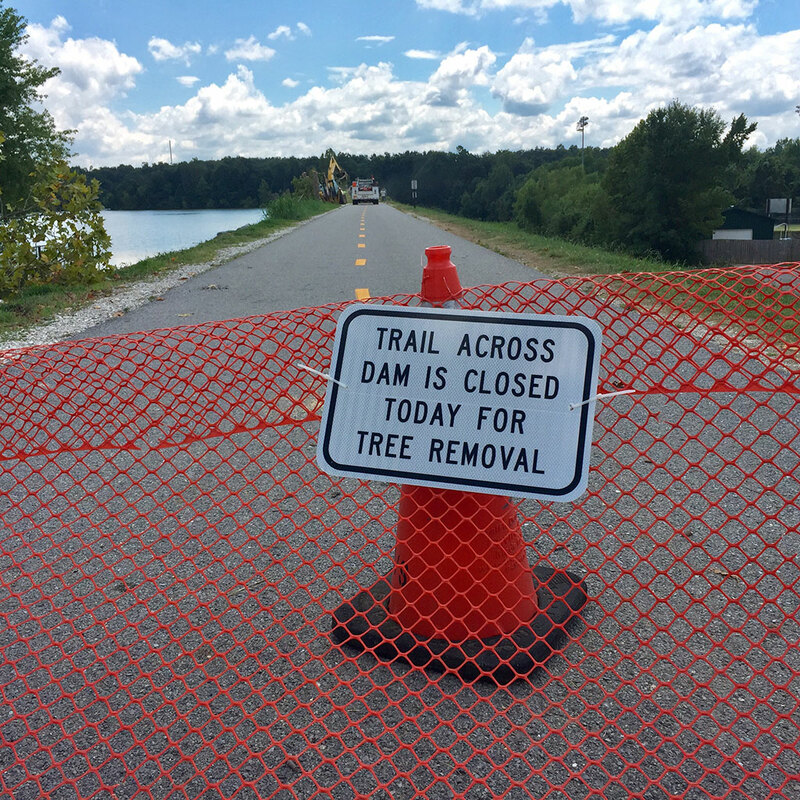 Anyone who circles the lake on foot or by bicycle should be aware that the trail over the dam is completely closed, meaning the only trail-based option for getting back to Veterans Park is turning around and making the 5-mile trek back to that side of the lake. Trail users headed north on the Razorback Greenway should take a right after the hill leading up to Veterans Park in order to continue north toward the Greenway intersection near Springdale. Greenway users headed south from Springdale should take a left at the Lake Fayetteville intersection to continue south toward downtown Fayetteville. This week’s work is focused on the above-ground portions of the trees. Removal of the root balls will take place later this summer. For more information, contact the Fayetteville Utilities Department at 479-575-8386. Why are the trees being removed? Nyander in June said the trees pose a threat to the integrity of the dam, and must be removed. During high water levels, Nyaner said, the root balls of the sycamore trees are under water, and could be blown over under high winds causing immediate dam failure. “These dangers pose a risk to all people, property, homes, and businesses downstream of the dam,” he said. The Lake Fayetteville dam is already classified as a high-risk dam by the Arkansas Natural Resources Commission. The classification is given to all dams in the state that could lead to a loss of human life if they were to fail.